Ita��s been a while since this fire-cracker impressed us with her movies. Anushka Sharma is back this year with movies like NH10, Bombay Velvet and the much-talked-about Dil Dhadakane Do in which the actress has done her first item number. While the song, Swing, will have other actors like Priyanka Chopra, Farhan Akhtar, Anil Kapoor and Shefali Shah, the main focus will be on her. Dil Dhadakane Do will see Sharma act alongside former boyfriend Ranveer Singh after four years. Directed by Zoya Akhtar, it will also have Farhan Akhtar lending his voice for a track. Interestingly, the collaboration between the actor and music composers Shankar-Eshaan-Loy has been a hit, with their last outing being Bhaag Milkha Bhaag. Despite a lukewarm response to her earlier film, Chalo Dilli (2011), Lara Dutta planned on making a sequel, Chalo China under her banner, Big Daddy Productions. Unfortunately, the projecta��which she was producing with her sportsman husband, Mahesh Bhupathia��was pushed to 2015 after the model-actress turned mother in 2012. Meanwhile, the 36-year-old is returning to the big screen with a family drama, Shamiyana, which also stars Kay Kay Menon of Haider fame. The husband-wife duo will also be releasing three other movies under their bannera��Abhi Nahi Toh Kabhi Nahi, in collaboration with producers Virendra K Arora and Arjun N Kapoor, Tamanna Radio Company, a musical love story, and a romcom called Matchfixing. 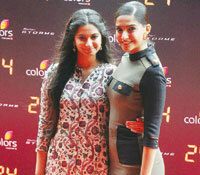 There is no doubt that Sonam Kapoor is the fashion queen of Bollywood. In fact, her costumes grabbed more attention than her acting did in her last release, Khoobsurat. The 29-year-old is now taking it a step further and turning designer along with her sister, Rhea. Talking about the untitled label, Kapoor said that Rhea has been working on getting it rolling for the last three years, but the project is just beginning to take shape. While the fashion label will not cater to couture, the designs will be elegant and will appeal to a wide clientele. We hope the actress takes an equal interest in her movies.